Dotdash revenue increased 32% in the 2018 fourth quarter year-over-year to $40.2 million, “due to strong advertising growth across several verticals… as well as growth in affiliate commerce commissions,” according to parent IAC’s latest earnings report released this week. 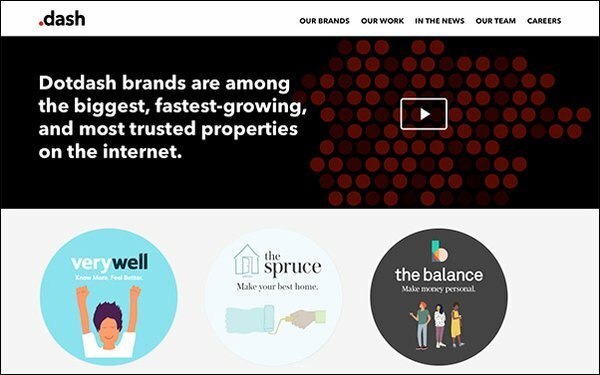 IAC says Verywell and The Spruce, Dotdash’s health and wellness and home improvement verticals, had “particularly” strong ad growth in the fourth quarter. This report is the first time Dotdash has disclosed revenue as its own operating segment. Dotdash is the rebranded About.com, the nearly 20-year-old site known for its “how to” articles and service journalism. The company also publishes The Balance, Lifewire, Investopedia and ThoughtCo. Dotdash’s 2018 revenue was $131 million, an increase of 44%. Operating income for Dotdash increased 140% in the fourth quarter year-over-year to $11.8 million. The sites reached 87 million unique users across its properties in December. That’s up from 51 million in 2016, when About.com rebranded and broke up into five verticals. In 2019, Dotdash plans to focus on brand awareness and e-commerce, according to the earnings report. Last month, the company announced the acquisition of beauty site Byrdie and women’s lifestyle site MyDomaine from Clique Brands. Dotdash is also providing guidance for 2019, predicting revenue growth of 10% for the first quarter and 20% for the year. IAC -- which owns over 150 brands and products, including Vimeo, Tinder and The Daily Beast -- brought in $1.10 billion in revenue in the fourth quarter, a year-over-year increase of 16%.